Thank You to Showrunner and Executive Producer, Robert C Cooper. We would like to send a big thank you to Rob for his Q&A event. It was a sold-out show! Rob’s generous discussion on the nuts and bolts of creating a show based on historical events was informative to all the writers in the room. 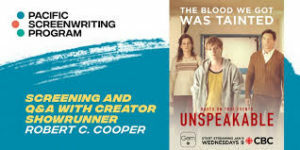 Rob recently completed writing and producing Unspeakable, a limited series based on the Canadian Tainted Blood Tragedy, now airing on CBC. Previously, he served as showrunner on Dirk Gently’s Holistic Detective Agency for BBC America, Netflix, and AMC Studio. Rob is well known for his work as showrunner for the Stargate television franchise. When one audience member asked Rob how his first-ever pitch went, Rob admitted that he wasn’t sure he remembered his very first pitch. He did recall his initial pitch to Stargate, early in his career. It mostly fell flat. It was only when he had exhausted his prepared material and he tossed out a few scraps of story ideas on a last desperate whim, that the show’s creator finally picked up his notepad and took an interest. The rest is history, so always give it everything you’ve got!